2015 was a year of significant accomplishments for Resolute. We entered North America’s consumer tissue market, invested in our growing pulp and lumber markets, achieved the best safety performance in the company’s history, and advanced our sustainability performance – all while maintaining a strong financial position in the face of a challenging business environment. In our latest annual report, Building the Resolute of the Future, we measure our performance and results against our goals and clearly articulate our business and sustainability strategies for the future. We achieved a world-class safety performance, recording an OSHA incident rate of 0.66, which is a 20% improvement over 2014. Four of our facilities reached or surpassed 1 million hours without a recordable injury. We expanded our production capacity by acquiring tissue manufacturer Atlas Paper Holdings, completing the Calhoun continuous pulp digester project, and ramping up production at our Atikokan and Ignace sawmills. We reinforced our environmental credentials by reducing mill environmental incidents by 55%, reducing absolute GHG emissions (scope 1 and 2) by 70% since 2000, completing our first full year of 100% coal-free operations (scope 1), and enhancing our disclosure of scope 3 emissions. We also transitioned our sustainability performance reporting to our corporate website, updated in accordance with the Global Reporting Initiative’s (GRI) new G4 standard. We continued to collaborate meaningfully with our stakeholders and created C$100 million in economic opportunities for our First Nations partners in Ontario. 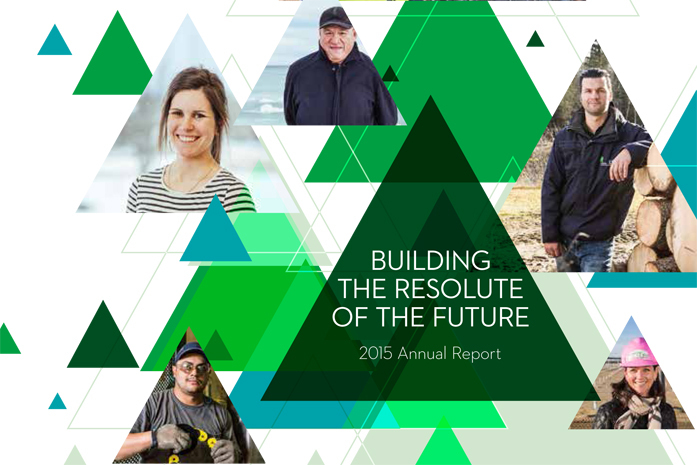 To learn more about how we are building the Resolute of the future, read the online version of our 2015 annual report.